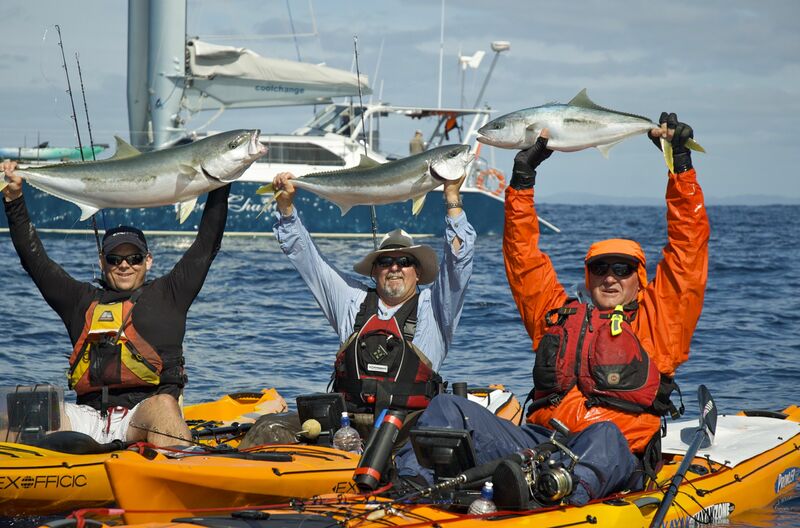 Though Rob Fort, of Coromandel kayak adventures, and Captain Peter MacKenzie, of the Taiho, worked their tails off for us on the first half of our trip in New Zealand, the weather was out of their control. For the most part we were stuck fishing the lee or protected side of islands with little to show for our efforts other than some small Snapper and one Kingfish which was barely a prince. Rob and Peter really knew their stuff and I am sure under different circumstances we would have been successful in our quest of big fish. I would fish with these guys again in a second if given the chance. The next stop on our trip was the area called Bay of Islands, made famous for its great fishing by Zane Grey . 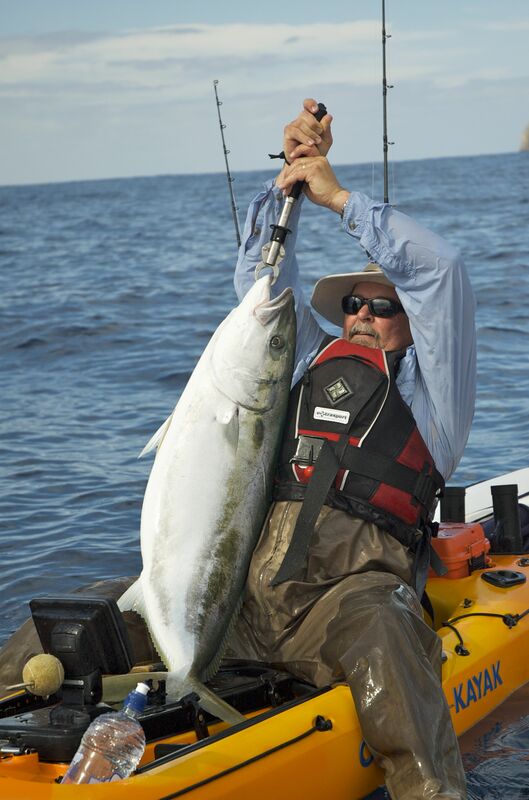 in his book Tales of Anglers Eldorado. Our hope of course was that the wind would give us a break and the fish would decide to eat, I don’t think that is too much to ask after our long trip and previous week of toil. On our way to Bay of Islands we met with Shamus, yes he only has one name, at Sportsman’s Choice/Kayak Zone, the kayak and tackle shop where he works. 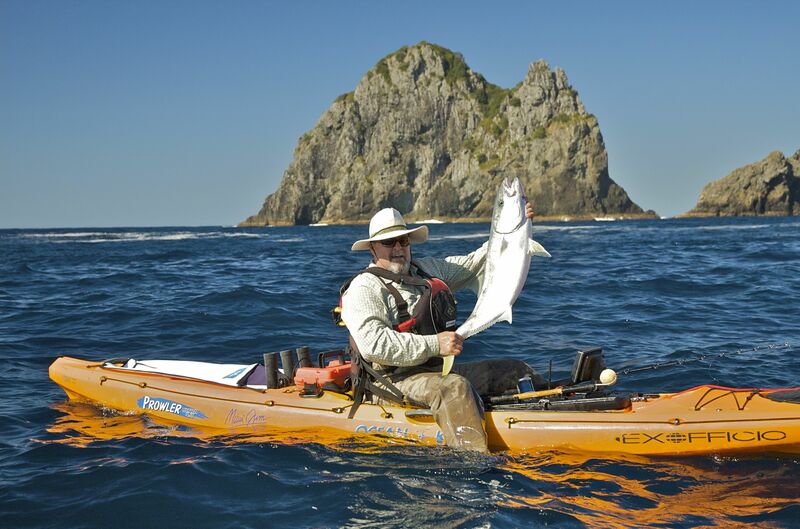 Shamus, a former street performer, is one of the local kayak fishing gurus and a member of Ocean Kayak New Zealand’s pro staff and would accompany us on our tour of the Bay of Islands for the next five days. During this meeting we went over the gear we would need for the remainder of the trip and the target species, which once again would be Kingfish, Snapper and if the conditions were right, Marlin. After this brief meet, we jumped in the car for the last leg of our five hour drive, stopping once for the obligatory New Zealand meat pie, a treat you can find all over the country. 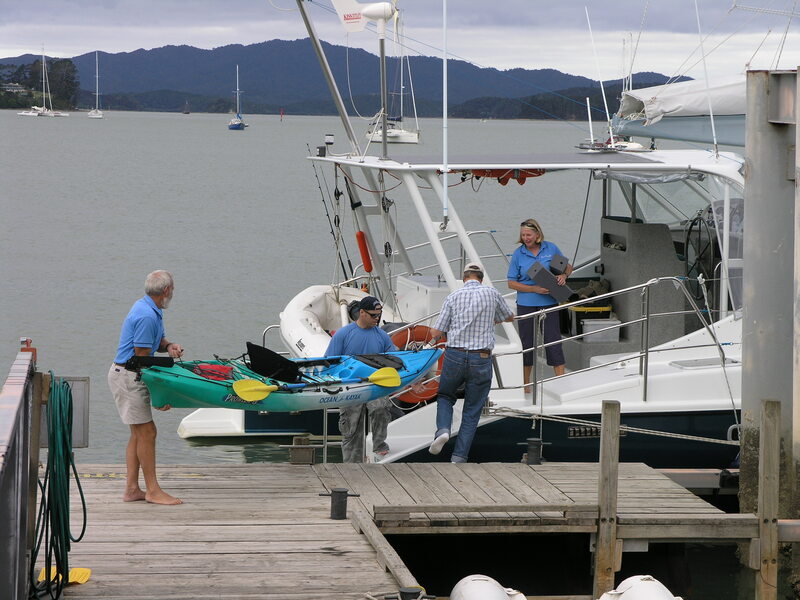 Tired from the long drive we arrived at Opua harbor and unloaded all of our gear, I think kayak fisherman carry more gear then any other anglers. I wondered how we would get it all on the boat, which we would be on for the rest of the week, and still have room to move about. 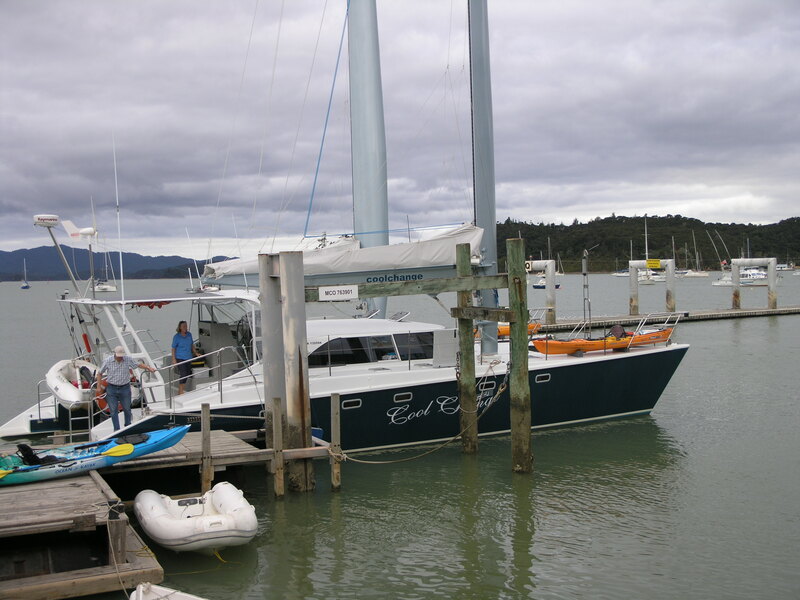 Shamus had set us up with Don and Marilyn Logan the owners of Cool Change, a 54 foot sailing catamaran that the couple had built themselves over the course of 7 years. 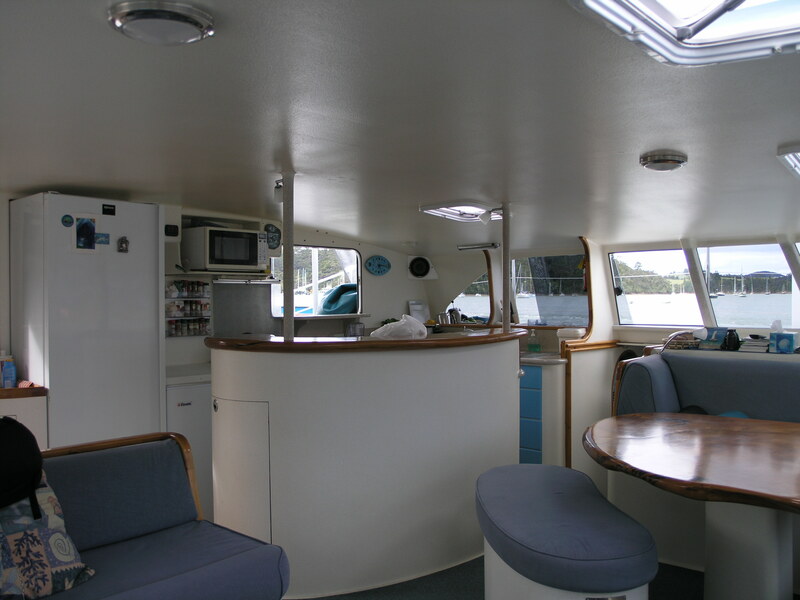 While the Taiho, our boat in Coromandel, was utilitarian and served us very well, the Cool Change was pure luxury. Don and Marilyn had spared no expense and overlooked no details in the design of the boat they would make their home and their business. I have to imagine they were a bit shocked when they saw all the gear we would be loading onto their home. 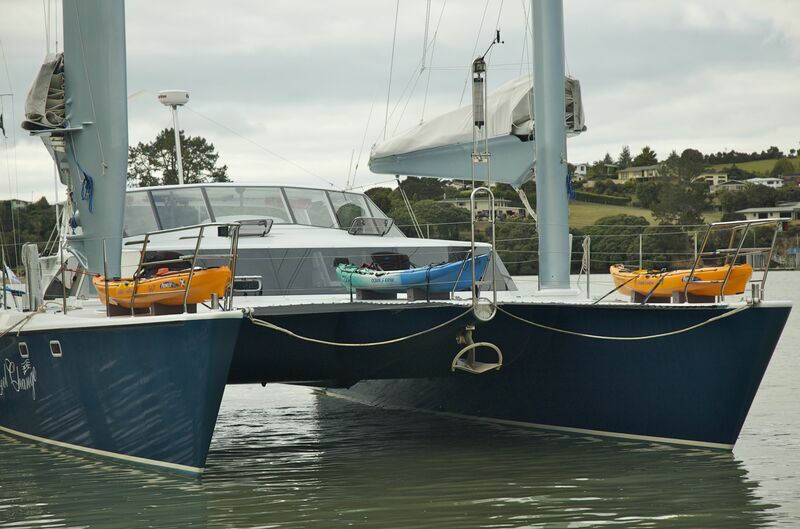 I have always said I could never live on a boat but after being on Cool Change I think I have changed my mind, of course only if I was on a boat as nice as this one. It had every amenity and was an incredibly stable platform, under power it moved through the water very well, under sail it just flew. Don and Marilyn welcomed us with open arms and the only clue that all our gear was an issue was when Marilyn took a photo of all of it spread across the deck saying, she never thought she would see her boat with so much stuff on it. As always loading a boat the first time takes a bit of time to figure out the best layout and ways to secure the gear and kayaks and this time was no different. Once finished though we had a great system that made loading and unloading the kayaks pretty simple, particularly when you have Jai’s muscles to help. By the time we were loaded up it was already late in the afternoon so the plan was made to make our way to a sheltered bay on one of the islands to anchor for the night, close to where we would fish the next day. During much of the loading and motoring out period Shamus worked diligently on his phone getting reports from some of the local fishing captains on not only the fishing but the weather conditions. We were all excited to hear that the weather and hopefully the fish should be cooperating with us for the next few days. Another plan was hatched that would prove to be a huge value to us for the rest of the week, and that was to hire a local guide, Captain Bucko, for a day so we could get some good up to date information on where the fish were holding and what techniques to use. I think the information we got from Bucko on that first day really helped to make the trip a success for us. Fishing day one at BOI we were met early by Bucko and loaded a couple of the kayaks onto his boat along with Will our videographer. 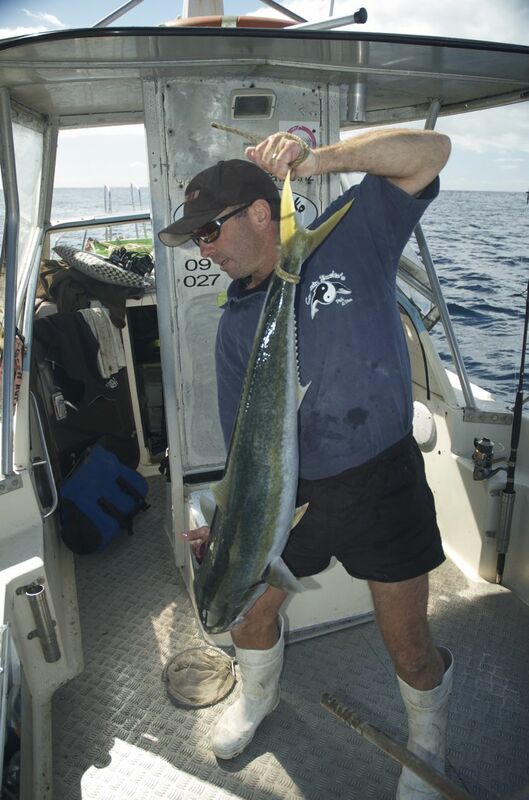 The plan was to hit a buoy that Bucko said would be holding some bigger Kingfish and toss some poppers on it. When we pulled into the area Bucko let out a few curses as a former client was now sitting on his spot and pounding the water with lures. We decided to give it a shot anyway as we could see the tails of the large fish swimming around the buoy. 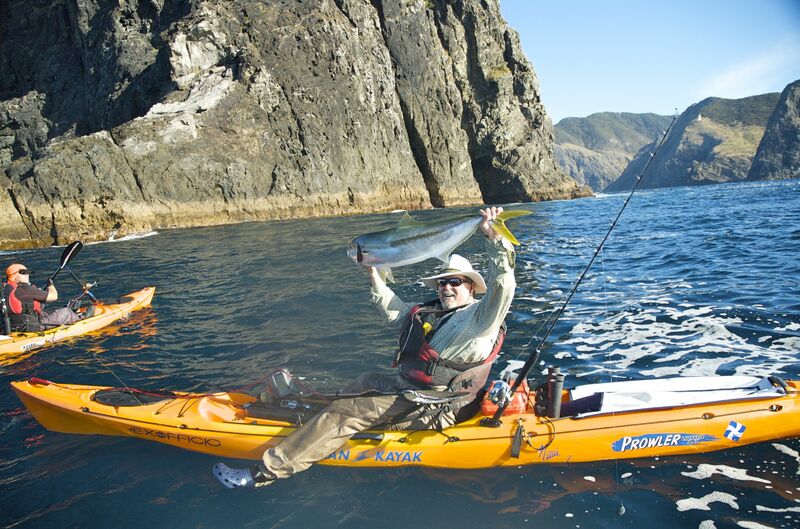 We tossed poppers for a while with no luck and reloaded the kayaks, this was the first sign of real fish on our trip to NZ and I was excited. From here we cruised around for a bit looking for live bait to fill the tank, once a school was located we picked up several Jack Mackerel for the tank but strangely enough had a hard time getting past the Kingfish to get the Macs. 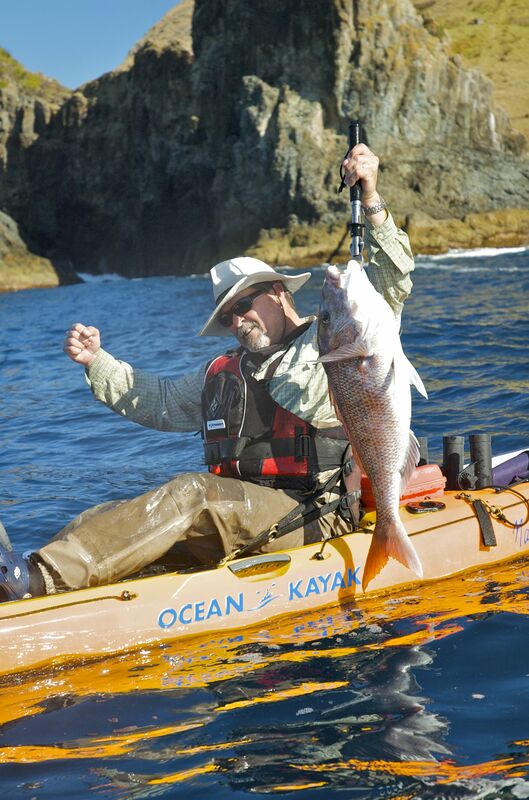 These Kings were under 20 pounds for the most part, Rats as they called them, but I would have been happy to pull on one from my kayak just to finally get to pull on a real fish. My wish would be granted soon enough. Jim in front of Hole in the Rock, large tour boat would run through the hole. 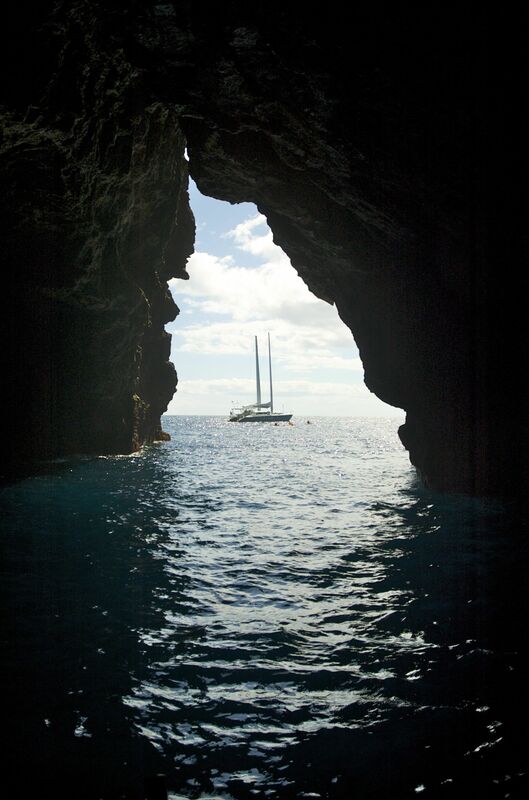 this was a large passage going through a small island. With some wind and a lot of current, sitting in the kayak next to the island was a lot like sitting in a washing machine with the kayak bobbing around in the wash. Jai, Shamus and I all put out live baits on our heavy gear as we were fishing water from 50-200 feet of water with a lot of structure. I was using a new Shimano Tallica 16 II loaded with 80 Hollow Ace powerpro line with a top shot of 100lb Seagar fluorocarbon leader and the other guys were fishing similarly heavy gear. The bait was set up on a dropper loop with enough weight to get you to the bottom. It didn’t take long for our first hookup and bust off in the rocks, each time bumping the drag tighter to try and stop these fish before they reached the rocks. By the time the day was finished my drag was basically locked, I have never fished drags this tight and still these fish would rock you. I managed to get a couple of smaller fish “rats” but was destroyed by several larger fish, Shamus landed a couple good ones but our strong man Jai was the master landing several better fish over 40lbs. Jai had switched from live bait to a speed jig, basically a very long version of a Butterfly jig, and this seemed to really be the hot ticket. I finished this day very frustrated by all the break offs but was also optimistic because we were at least having the chance to pull on some good fish. Day two in BOI, Captain Bucko, though not actually guiding us, gave us some calls on the phone and radio to tell us where he thought we should try and even brought us over some more live bait. We started the day off fishing a spot called Bird Rock and my luck from the previous day changed; I trolled live bait around but for the most part switched to a Butterfly Jig I had brought on the trip. I landed several nice fish on this jig before once again getting destroyed in the rocks by a bigger fish. For the jigging I was using my Shimano Torsa reel matched with a Trevalla rod which was a great combination for fighting these strong fish. Once again the drag was pegged to keep the fish out of the rocks and I had much more success at it this second day than the first. 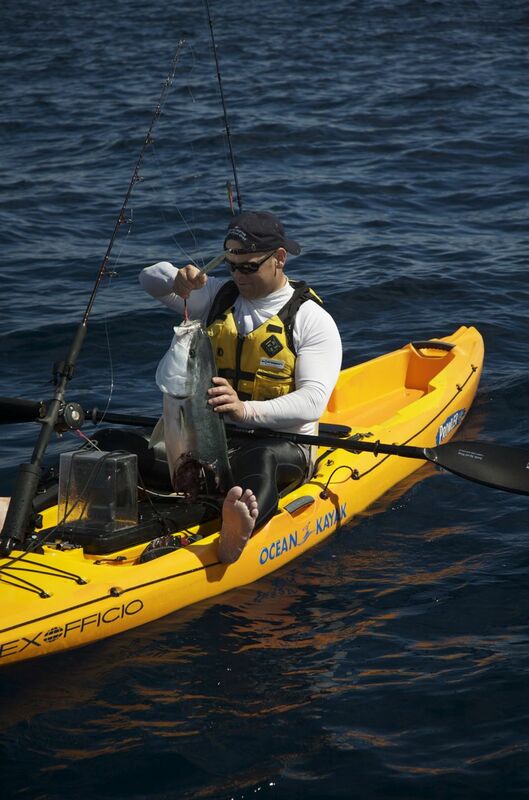 Fishing a drag this tight, you really had to stay on your game or you could find yourself out of your kayak. After leaving Bird Rock we headed to Cape Brett, this was a beautiful spot with a lot of good structure. I trolled live bait along the cliff and got slammed by what I thought at first was another Kingfish, this tough fighter turned out to be a better sized snapper of 16lbs. If a 16 pounder fights this hard I can’t imagine how hard the 20-30 pounders fight. A few more fish were landed in this area then we made the short paddle across a small channel to give Hole in the Rock another shot. 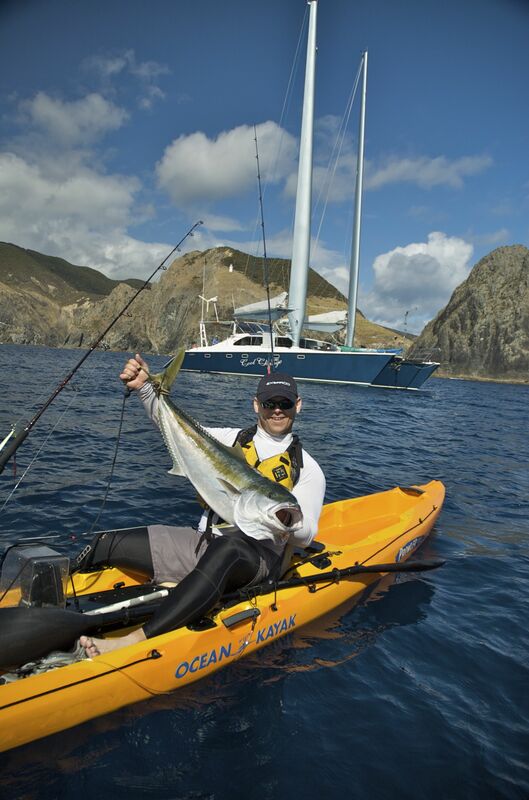 We landed a few more fish over here and Jai lost one to a Bronze Whaler shark and had a Mako shark swim under his kayak. Shamus continued to fish live bait but it really seemed the speed jigs were the way to go as Jay and I both landed a good number of fish and lost some more to the rocks. A little later in the day Jai was fishing along the island and had another fish stolen from him by a shark and brought up only the head. A few minutes later I hooked into what felt like a real good fish and had it close when the tell tale feeling of a shark was on my line. I quickly brought up half a fish. I grabbed the lure and was bringing my prize aboard when suddenly out of the water the shark grabbed what was left of the fish, right out of my hand. Thankfully the camera was rolling and got all the action. I counted all my fingers and laughed very nervously afterwards, I am sure there will be a lot of beeps in that segment. In the process of grabbing the fish the shark splashed water into my eyes which of course got sunscreen in them, so not only did I have a shark under my boat, I was blind. It was crazy and I am sure I will be telling this story for years. That night we were all exhausted from pulling on fish and from a long day on the kayaks. Don anchored Cool Change in a spot called Whangamumu, which was the first whaling station in New Zealand. Shamus kept close tabs on the weather and reports from friends and suggested a ballsy plan. 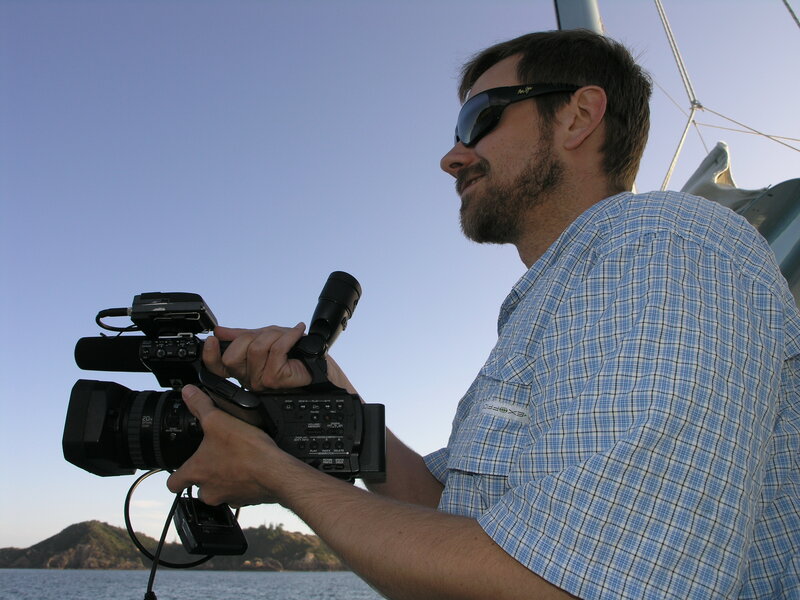 Because we really had some great footage already he suggested we give a shot at fishing the Poor Knights islands, this would mean a long run and if the weather was bad we would have no place to hide. If the weather was good and conditions right it could mean very good fishing and a shot at Billfish. We took a quick vote and decided to make the run, why not we already had great fish footage and footage of a shark trying to remove my hand, anything else is bonus. We were up early the next morning and running in the dark to get to the Poor Knights islands. This small island chain is a protected area but has some reefs nearby that are fishable, but if the wind is up it would be a long run for nothing. Well as luck would have it on this half of the trip the seas were dead calm. We located the reef on the fish finder of Cool Change and we all marked it on our Humminbird Gps fishfinders so we could stay on it on our kayaks. The current was running pretty good, so having the combo of fishfinder and GPS was imperative to not only stay on the reef but also to locate those fish holding just off the reefs edges. Jai and I went straight to using the jigs and it paid off fast as Jai had three fish his first three drops, I quickly caught up with him and what followed was the craziest, wide open Kingfish/Yellowtail bite I have ever had. To the point we all lost count of how many fish we caught and released. Shamus who was fishing chunk bait hoping to change things up with a large Grouper, ended up catching a John Dorey, a very tasty fish, then switched to the jig to add to the Kingfish count. Shamus’s instincts paid off this day by making the call to run out there, it was amazing fishing. Though we saw no signs of Marlin it was well worth the run. 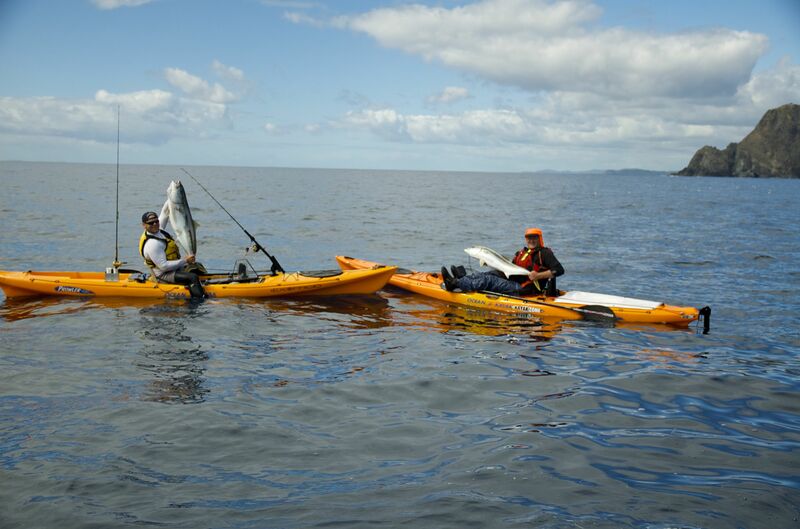 To further show the superior fishablity of the kayaks, there was a small charter boat fishing in the exact same spot as us. As we are hooting and hollering and having the fishing time of our lives, we saw this boat hookup only once. He finally motored away in disgust. Of the countless number of fish we caught we only kept a few and had wonderful meals of seared yellowtail and fresh as you can get Hamachi. Over the years I have caught hundreds of Yellowtail/Kingfish, in San Diego and Mexico and I have to say these were the strongest, hardest fighting of them all. I don’t know if it was due to the high competition for food or the fact that these fish were constantly on the move to avoid becoming dinner for the many sharks. There were many times I would have my drags pegged and my thumb on the spool and I still could not stop them from taking line. I didn’t manage to get that Marlin or huge King I was hoping for but did get my personal best and largest of the trip at 45 pounds. I am not sure what I would have to do to stop one of over 100 pounds; this of course makes me want to return to give it another try. This trip, like most of our trips was made special not only by the fishing but by the people we were able to fish with and the friendships we formed. This trip would not have been possible without the help of all these great people and we owe them many thanks. 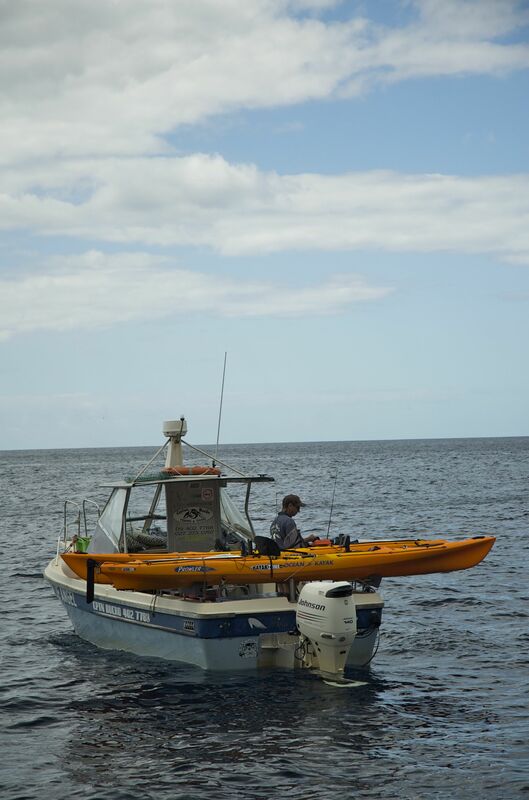 Tony Free of Ocean Kayak New Zealand was our host, logistics manager, personal chauffer, galley worker, and all around great guy to hang out with. 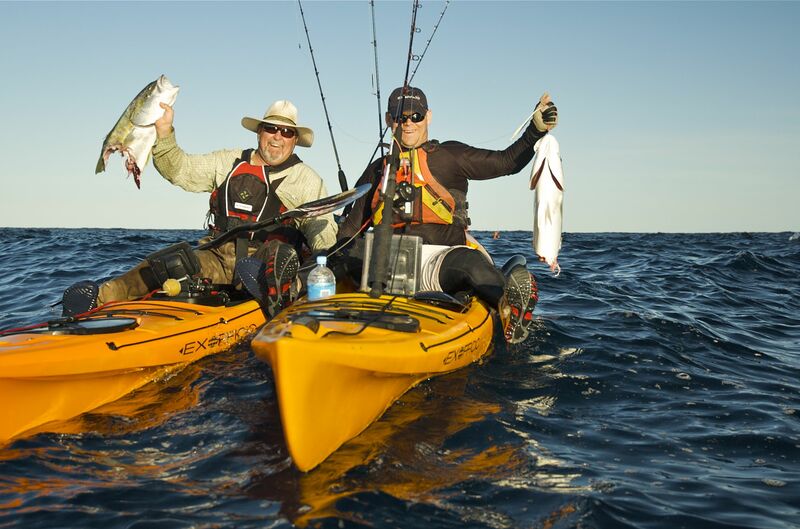 He also hooked us up with fully rigged Ocean Kayak Ultra 4.7 kayaks for the trip which were just fantastic to fish from, I hope we will see some of their innovations come to the US market. 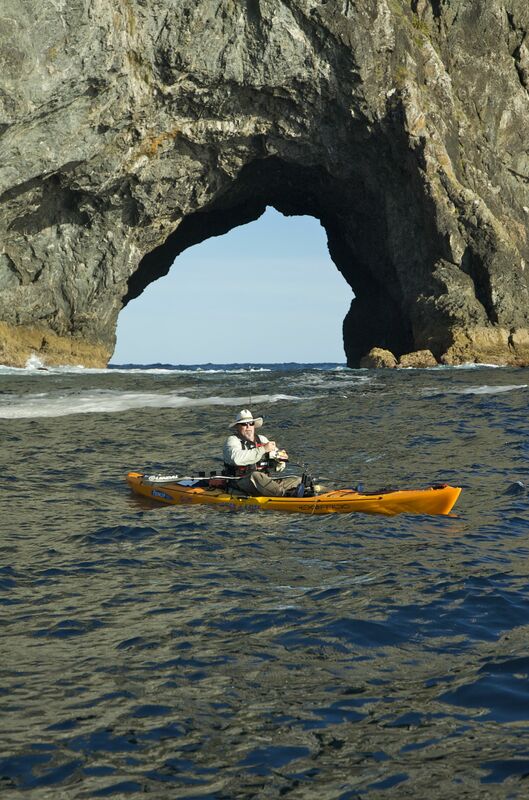 Rob Fort of Coromandel Kayak Adventures and Peter MacKenzie worked so hard in the worst of conditions to make the tough part of our trip a great experience. 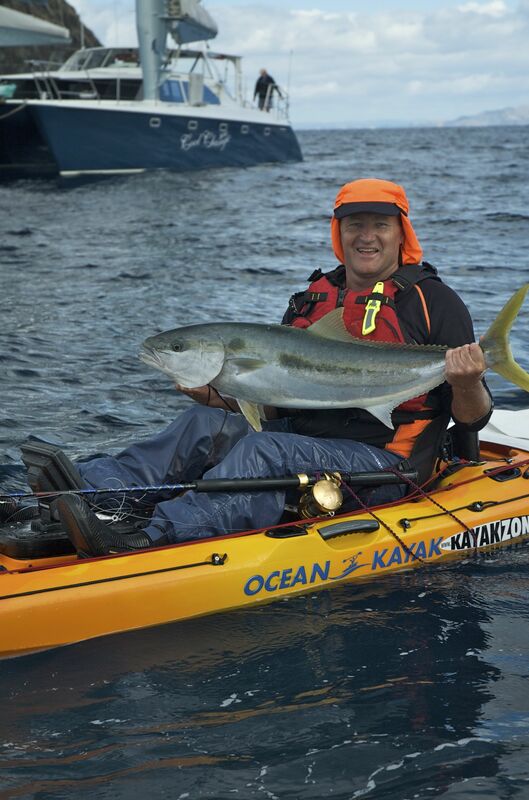 Shamus of Kayak Zone NZ helped put together the Bay of Islands and was always in touch with his network of fisherman to make sure we found the fish. Captain Bucko helped us get the area dialed in but also kept in touch with us on a second day to make sure we were successful. He was a mountain of information about the area and I wish we could of spent more time together on the water. Don and Marilyn Logan of Cool Change Charters were the consummate hosts even as we filled their home with more gear than they had ever seen. Their boat is truly a work of love which can be seen in every detail. Jai Sanders, thanks for just being a great guy to hang and fish with and for always stepping up when anything needed to be done. Of course Will Richardson the man behind the camera who has to work so hard to make us look good. 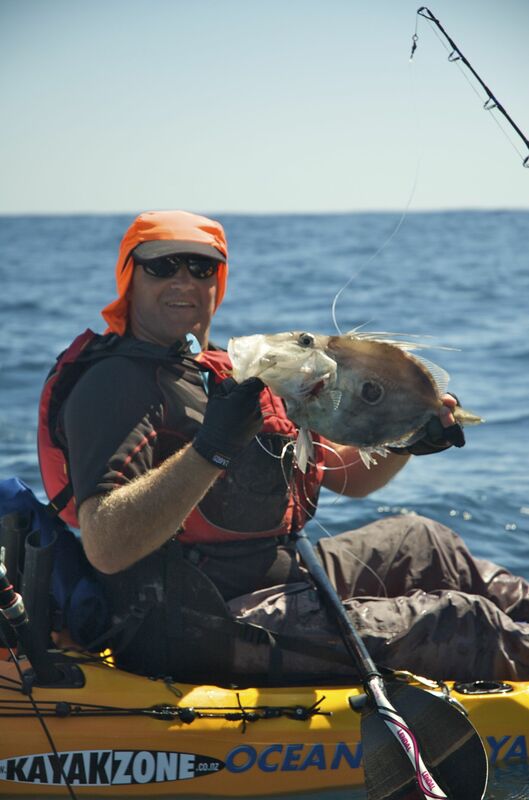 New Zealand was a wonderful country to visit and the fishing was as good as it gets, I am sure we will get a couple of great episodes for the second season of The Kayak Fishing Show out of the trip. We are already planning a return trip. Next stop for us is the East Coast of the US, fishing in southern Georgia and Jacksonville Florida in May. We will keep you posted on how we do. Have you contacted your cable provider yet to tell them you NEED WFN? Sweetness! Great job and what fun too! Excellent! Nice!! looks like the second 1/2 of the trip went well. Great times. I enjoy reading these post. Also just saw the trailer for Game On 2, congrats, look forward to seeing it.